Well, for businesses, anyway. Under the excitingly-named Containers and Packaging Recycling Law, medium- and large-scale businesses are obligated to recycle all glass and plastic bottles, paper and plastic containers. See, we told you we love Japan! Businesses have to pay – based on weight and volume – for recyclables to be collected, which also explains those signs outside convenience stores that tell you not to put trash in that’s not from their store. 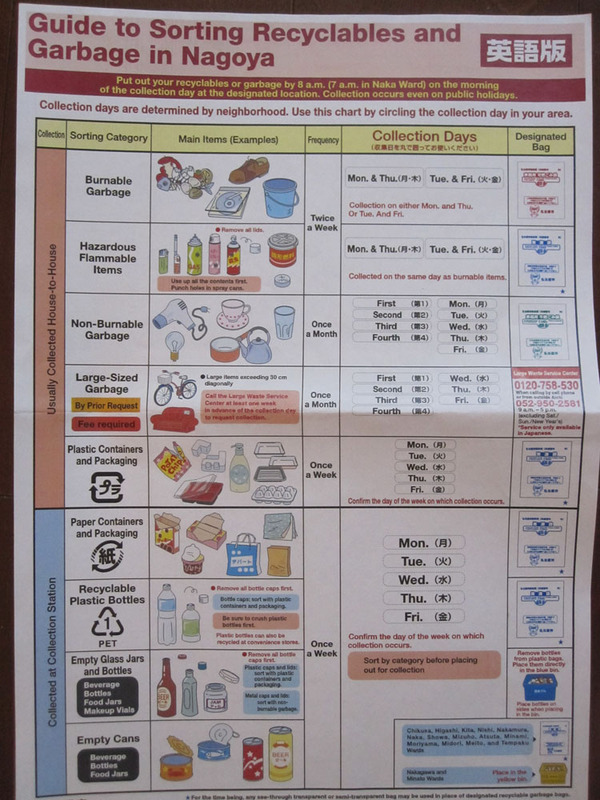 In my native England, recycling collection varies from city to city – just as it does in Japan – but kerbside sorting is common: you put all your recyclables (cardboard, glass, plastic) in one container all mixed up, and when the waste collection guys come round they sort it for you, throwing the different types of recyclables into different parts of their giant truck. There’s one important reason for this: properly trained staff are much better at sorting trash than us ordinary British folk, so having the professionals do it is actually a good way to minimise waste. Recycling (and combustibles, too) has to be put out in local-authority designated clear bags – so if you put the wrong thing in the wrong bag, you might well find your trash left at the collection point with a doom-inducing sticker on it explaining your misdemeanour. And then everyone in the neighbourhood will know that you hate the planet. Bill is outside the apartment block. He sees a woman from the neighbourhood. Bill: Good morning! It’s a beautiful day today, isn’t it! Woman: Oh, Bill-san, good morning! Oh… oh no! Bill-san, you can’t put out old video cassettes on Tuesdays. Video cassettes have to go out on the third Wednesday of the month. And I noticed last week you put your trash out the night before the collection! You can’t do that. Please only take it out before 7 am on the day of collection like everybody else. Bill: Oh, I am very sorry. Thank you so much for your kind advice. I will be more careful. See? Even perfectly fluent exchange students make mistakes sometimes! If you’re studying Japanese, check your textbook for trash-related apology phrases. You’re going to need them at some point. …but those rules are available – in most cities anyway – on a handy poster that you can cover your entire fridge door with! And it’s available in (wait for it) English, Japanese, Chinese, Korean, Portuguese, Spanish, Filipino and Italian. What’s your excuse? 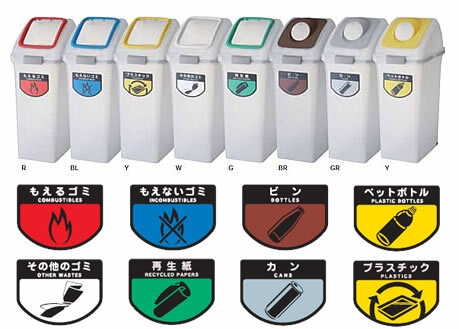 As Japanese blogging site Madame Riri pointed out in an article last month that asked why Japan is so darn good at recycling anyway, Japan has an overpackaging problem. Although there are more eco-oriented alternatives available (furoshiki, anyone?) it’s fair to say that Japan is pretty keen on wrapping up things that don’t need it. Individually wrapped bananas, corn on the cob, and even oranges are common sights. 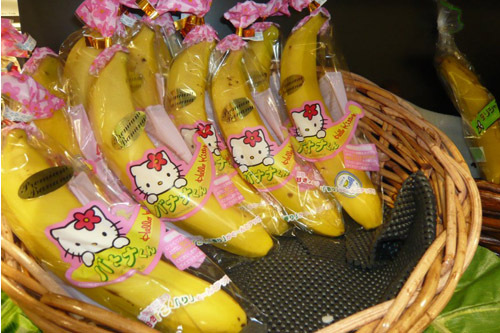 ▼We can’t say Kitty isn’t cute, but bananas already come with a wrapper… it’s yellow and biodegradable. A side-effect of this packaging mania is that in supermarkets, there’ll often be a recycling bin right next to the cash register, where you can remove excess packaging from your goods as soon as you’ve paid for them. Sure, it’d be better if the supermarkets actually stopped plastic-wrapping corn and apples, rather than packaging them up and then allowing you to unpack them immediately, but it’s a start. Ever the enterprising nation, Japan has come up with some impressive ways to use recycled materials, too. Tokyo’s Haneda Airport is built on an artificial island made of garbage, and there are brilliantly obscure recycling initiatives like The Japan Denture Recycle Association, a one-man venture based in Saitama Prefecture that recycles the metal from donated unused dentures, with proceeds going to UNICEF. It is complicated here in Canada too.